'I have always maintained that colonialism and nuclearism in the Pacific are part of the same evil,' says the late Prime Minister of Vanuatu, Walter Lini, in his preface to David Robie's Eyes of Fire. 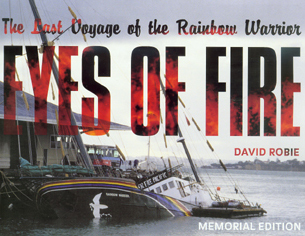 Originally released in early 1986, and now re-released in a memorial edition, Eyes of Fire chronicles the last voyage of Greenpeace's Rainbow Warrior through the Pacific. The book covers the expedition from its beginning, the rfelocation of 320 Rongelap Islanders from their radioactive homeland to its end when a peace flotilla reached Moruroa atoll - minus the Rainbow Warrior. Robie's in-depth understanding of Pacific affairs makes this more than a story about a famous ship. His narrative explores the effects of French and American colonisation, and the environmental degradation through images of fallout from the 1954 Bravo nuclear test over Rongelap, toxic waste dumping in Kiribati, or the first "ghetto of the Pacific", near the US military base on Kwajalein Atoll. But it's not all doom and gloom. The story is punctuated with humurous anecdotes from the voyage - paralysis after a kava-drinking ceremony, the "breakfast club" on board ship who scoffed meat at 4am before the vegetarian cook awoke or Bunny McDiarmid's saxophone practice that only Fernando Pereira was privy to. This image is made more poignant knowing Pereira died in the later bombing. 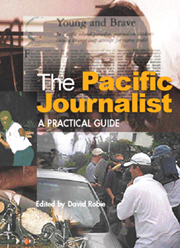 As a freelance journalist, Robie spent 10 weeks on board the Rainbow Warrior, putting him in a unique position to capture events as they happened. His journalistic style combines lyrical description with quotes, transcripts of news bulletins and extracts from the ship's log, lending a real time pace to the story that keeps you interested. 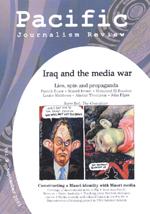 In Auckland, where Robie disembarked just three days before the fateful bombing on July 10, 1985, he pieces together events and documents the reactions of the crew and the media, New Zealand and French. Sometimes the host of characters, political and legal intrigues, and the minutiae of history get a little confusing, but the wealth of photographs and maps acnchor the text. The new book has an additional preface by Greenpeace activist and Rainbow Warrior crew member Bunny McDiarmid and a postscript by the author. In the aftermath of the "gone by lunchtime" debacle, Eyes of Fire is a timely reminder of the dangers of nuclear militarism. For anyone interesting in gaining a wider understanding of Greenpeace, the Rainbow Warrior bombing, and the effects of the Cold War in the Pacific, it is a fascinating read.